The Partnership between Avon and The Gambia is celebrating 20 life-changing years of working together. As a direct result of this partnership, The Gambian Government have provided eight new fire stations which means that each division of the country now has fire and rescue cover from Banjul (the capital) to Basse (the largest populated centre over 300 miles up river) . 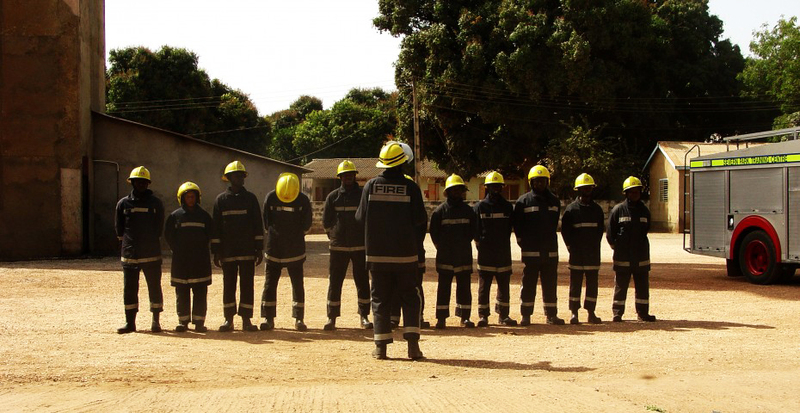 The success of this long term working relationship is evident, not only in The Gambia Fire and Ambulance Service’s ability to extend a sustainable Fire Service, but it also provides a humanitarian service to the communities it serves. More importantly, the eight hundred jobs created mean eight hundred families are provided for with security and respect in their communities – which also supports capacity building within those communities. Airbus UK and SerCo have supported this project by the donation of equipment and provided vital training for Banjul International Airport fire crews, both in The Gambia and in the UK. This work is pivotal in maintaining full operation of the airport, which is essential in supporting The Gambia’s tourism and subsequent economy. This is a major area for attention in respect of the improvement of resources and further training. In October 2004, a charitable trust was established to secure the long term future of the project, Charitable Trust. No 1106650. The preservation and protection of health by the provision of Fire and Rescue vehicles and equipment to The Gambia enabling them to provide a life saving and humanitarian service. To advance education in relation to all aspects of preserving and protecting health for the benefit of the public in The Gambia.